Golden Agri is the world's second-largest palm oil company by plantation area. It recently announced its 2Q earnings on Friday where profit fell 39.9% y-o-y. The operating environment has clearly seen continued effect from the European demise as well as slowing growth in US and China, impacting revenues and palm oil prices. Nonetheless with recent droughts also causing crop shortages such as soybean, sunflower, it seems like there may be a bottoming out of palm oil prices. There has been a recent run in stock prices of many commodity counters such as Olam and Noble Group and there was a blog post on them on Friday. Check out the post here. Outlook - Watch then Buy. Golden Agri share prices have already taken a beating on 8th Aug before National Day seemingly in preparation for its slightly dismal earnings report released on Friday. Prices have touched the lower bollinger even before the earnings report. 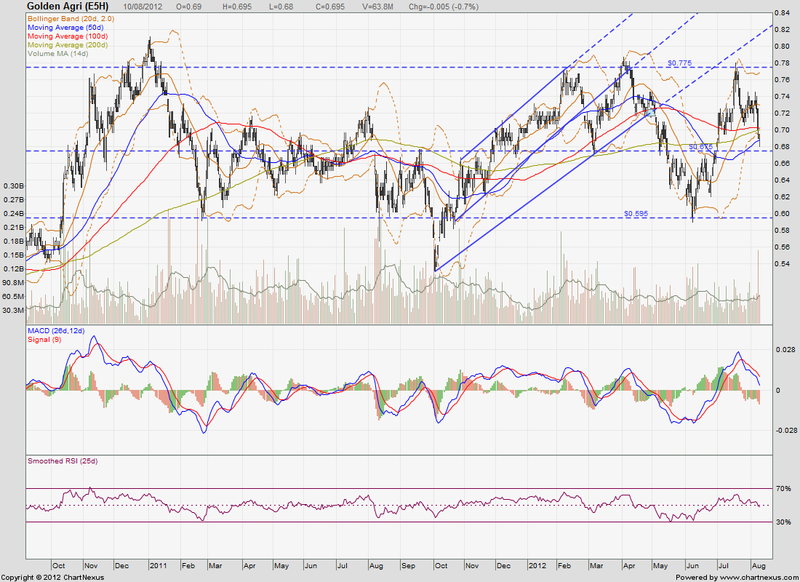 Expect some more selling pressure to around $0.675 levels before expected support. Would be buyers at that level or if it breaks down into the 0.60-0.67 region as palm oil prices are still expected to show some support into the 2nd half of the year. 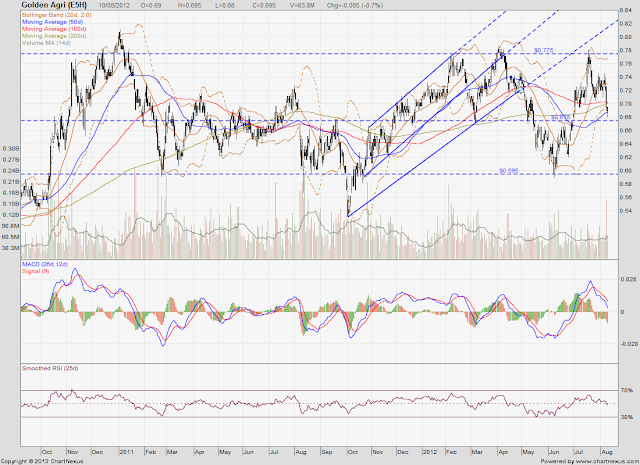 MACD - MACD trending downwards with negative divergence increasing. 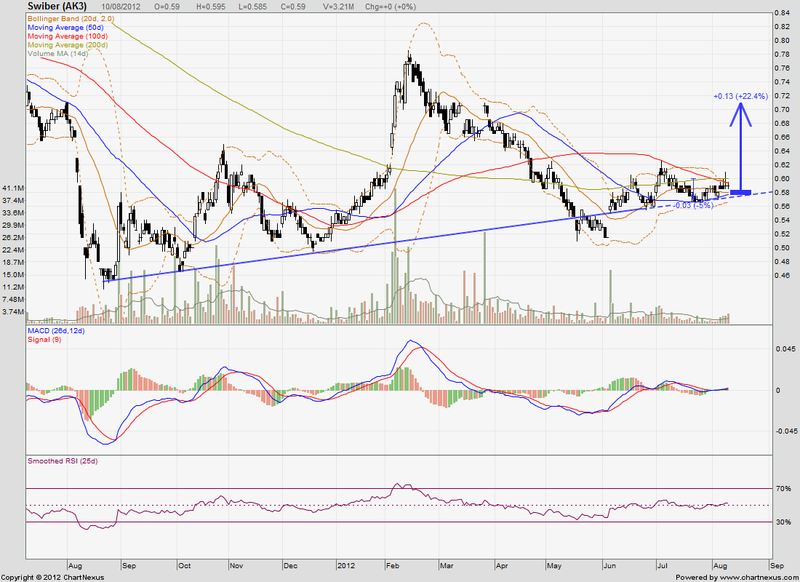 RSI (25d) - RSI just crossed below 50%. Bollinger Bands - Bollinger bands are widening and prices are riding the lower bollinger band already. 200d MA - Prices have just crossed below the 200d MA. Volume - High volume on 8 Aug in anticipation of earnings report. Clear winner for the selling side given a large black candlestick with unusually high volume traded. Swiber is a Singapore-based Offshore Oil & Gas player providing construction, marine and subsea services. With an order book of more than $1.8 billion in waiting, it is definitely a company with secure earnings up to 2013 at least. Most recently in June, it clinched contracts worth US$830 million for work in Asia Pacific region with work that has already began. Nonetheless, it faces strong headwinds from the economic downturn as well as strong competition from local and global oil & gas players in this very competitive landscape. Outlook - Buy. Its stock prices have stabilised around the $0.5-0.7 region that represents an attractive valuation of the company at 6x PE (taking 1Q 2012 earnings of US$12million and projecting it for the year as US$48million) current price of S$0.59. Note that its historical PE stands at around 8.5x (as obtained from its website/share investor). MACD - is trending upwards slightly over the last week and has crossed over its signal line for positive divergence. Bollinger Bands - Bollinger bands are constricted very narrowly at the moment. Prices are on the upper bollinger region with a possible break coming up. 200d MA - Prices are still slightly below the 200d MA and resisted by it. Volume - is increasing slightly over the last 3 days.